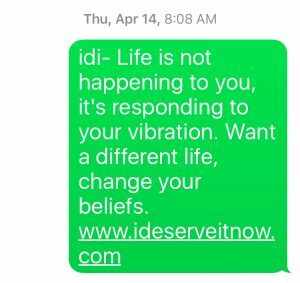 Daily idi Text - I Deserve It Now! It’s in your daily routine! Do your days begin with chaos? Forgot your project for work? Is communicating with your partner strained? Then It’s time to say YES to an EASY HABIT. 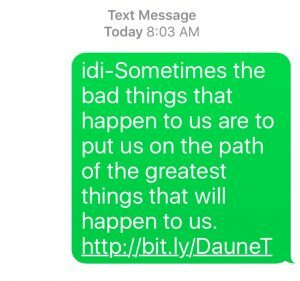 Success coach Daune Thompson delivers the Inspirational Daily Dose text to your phone. Start YOUR new empowering daily routine TODAY. Text message sent to you M-F am inspiring you to stay focused and on track. 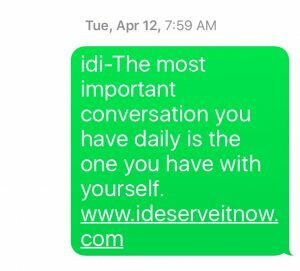 FREE DAILY i d i TEXT!